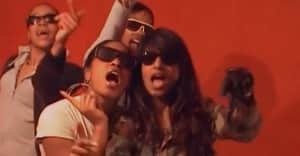 After teasing snippets of audio and video on Instagram last week, M.I.A. dropped Matahdatah Scroll 01 Broader Than a Border today as the latest exclusive courtesy of Apple Music. The project is a short film scored by two songs: "Warriors," from her 2013 album, Matangi, and a new track titled "Swords." "I directed and edited my first music video for 'Warriors' for my last album," the singer wrote in a press release. "I held it back until now," she continued, "because it inspired me to make a whole series of songs and videos on the concept of borders... There's ten more of these countries coming and I haven't chased where to go yet, so who knows where this project will take me. 'Warriors' was shot in Cote d'Ivoire with a guy I saw in a Youtube video doing the most incredible dancing." You can check out the new material above, and read M.I.A. 's FADER interview.